Some scientists think a brown dwarf or gas giant bigger than Jupiter could be at the outer reaches of the solar system. In this image showing relative size, the white object at the upper left edge represents the sun. You know how you sometimes can sense that something is present even though you can't see it? Well, astronomers are getting that feeling about a giant, hidden object in space. And when we say giant, we mean GIANT. Evidence is mounting that either a brown dwarf star or a gas giant planet is lurking at the outermost reaches of our solar system, far beyond Pluto. The theoretical object, dubbed Tyche, is estimated to be four times the size of Jupiter and 15,000 times farther from the sun than Earth, according to a story in the British paper The Independent. Astrophysicists John Matese and Daniel Whitmire from the University of Louisiana at Lafayette think data from NASA's infrared space telescope WISE will confirm Tyche's existence and location within two years. The presence of such a massive object in the solar system's far-flung Oort Cloud could explain a barrage of comets from an unexpected direction, according to a December article at Space.com. Its 27 million-year orbit could also explain a pattern of mass extinctions on Earth, scientists say. 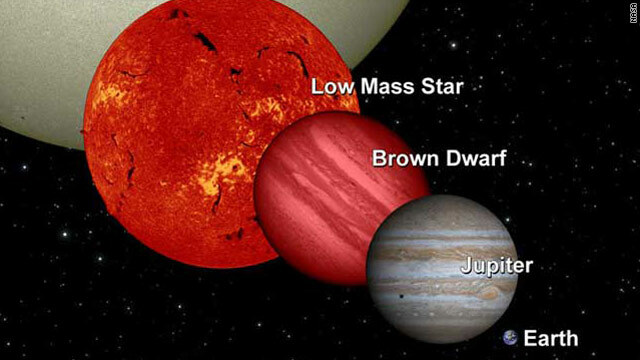 Brown dwarfs are cold "failed" stars; their dimness and lack of heat radiation can make them hard to detect. Gas giants are huge planets - like Saturn, Jupiter and Neptune - that are made up of gases and may lack a solid surface like Earth's. Whitmire told The Independent that Tyche will probably be composed of hydrogen and helium and have colorful spots, bands and clouds like Jupiter. "You'd also expect it to have moons," he said. "All the outer planets have them." Tyche was first hypothesized in 1984 as Nemesis, a dark companion star to the sun. It's been the subject of astronomical research and debate ever since. In July, another Space.com article said the celestial evidence suggests Tyche could not possibly exist. To distinguish it from the Nemesis star theory, Matese and Whitmire are calling their object Tyche, after the good sister of the goddess Nemesis in Greek mythology. Their research is published in Icarus, the International Journal of Solar System Studies. I am no longer positive where you are getting your information, but great topic. I must spend some time learning much more or figuring out more. Thank you for fantastic info I was searching for this info for my mission. 2 years has passed. I'd like to hear some news on this. What's the situation?